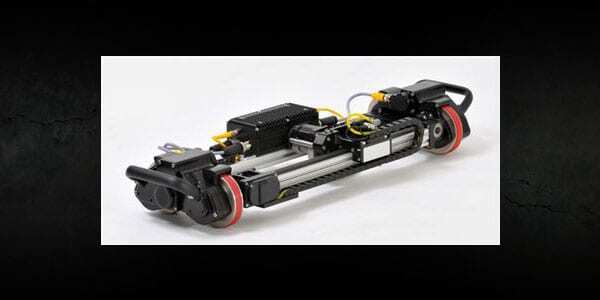 The MFE – HSR Crawler (High-Speed Raster) is an innovative ultrasonic scanner that addresses the need for an automated raster type unit offering higher performance and durability over an extended range of applications. 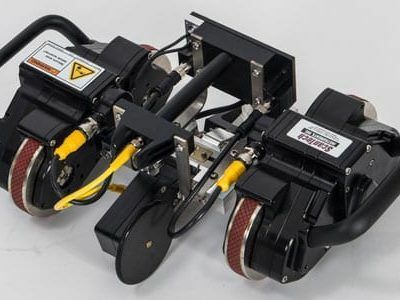 The scanner traverses large vessels with obstacles that are problematic for most tank crawlers, yet performs corrosion scanning on pipe down to 2″ nominal diameter while requiring no probe adjustments over the range. The scanner offers high maneuverability via steering with the controller’s touch-screen interface or optional extended joystick. a spring-detent suspension allows all for our the large diameter magnetic wheels to maintain contact on uneven surfaces. Locking the suspension provides optimal alignment on pipe. A parking function lifts the advanced transducer/coupling shoe assembly for crossing over larger obstacles. 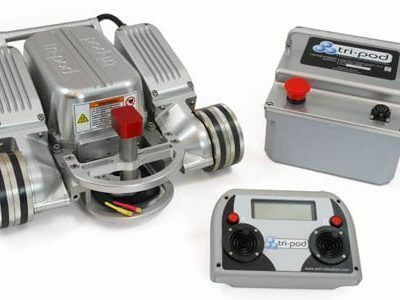 High scanning speed is achieved without sacrificing high torque and actuator force, and the specially engineered gears are coupled directly to all four wheels through a compact, sealed enclosure for durability and low maintenance. The high quality servo motors are powered with specially designed low EMI motor drives in a closed-loop configuration, offering high positional accuracy. Scanning operation may be controlled using simple step and directional signals. A home positioning routine is utilized with solid sate end sensors for collision control. Conventional or phased array type transducers can be deployed, and the scanner is offered in extended stroke lengths.